You are currently browsing the tag archive for the ‘Dendritic Opal’ tag. There are times when I feel compelled to write about a certain topic. Today I would like to share the story of my Treescape series. 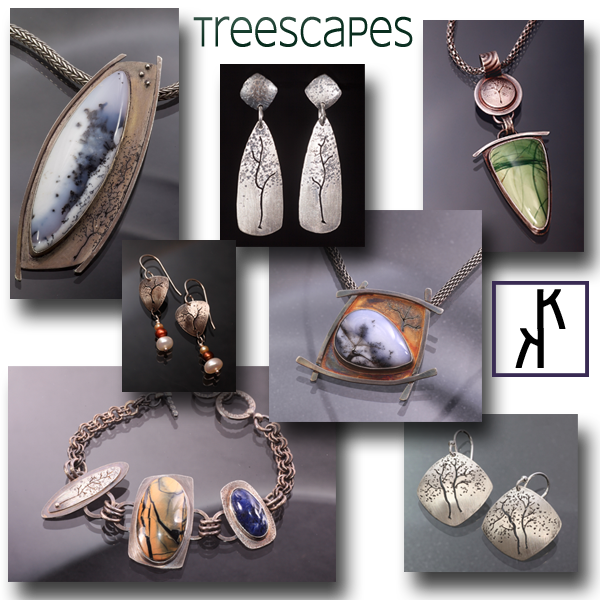 On September 15, 2011 while I was at the Denver Gem and Mineral Show, Treescapes was born. I purchase a number of my stones from Mark Lasater of The Clamshell. On that particular Thursday in September, as we greeted each other, he was very excited about a new batch of Dendritic opals he had. Mark knew this was (and still is) one of my favorite stones. He said to me, “You won’t believe what these look like”. Each one had a beautifully shaped tree, formed by the black dendrites in perfect contrast to the white in these stones. It was remarkable and this was the first of those stones he showed me. The minute I saw this, I knew exactly what my design would be. That was a first for me. What I didn’t know at the time was I was about to find my artistic voice. Treescapes has grown (yes a bit of a pun here) and evolved since then. Initially I was just focused on the Dendritic Opals that had tree shapes in them. The response to those designs was wonderful and I started to think I could use other stones whether they had any tree elements to them or not. It’s in my nature to try to understand the ‘why‘ about things. I wanted to understand why this series was becoming so important to me. I love trees and that is the foundation of Treescapes. My work has always been very organic. While I find symmetry beautiful, you will rarely see that in my pieces, because I am drawn to the uniqueness of leaves, flowers, trees; those elements in nature where nothing is identical. I explain to people that just as no two snow flakes or leaves are exactly alike, neither is any of my work. Each pieces is designed and made by hand, my hands. The goal with my art is to reflect that uniqueness found in nature. In addition to that, my father was a landscaper, as was his father. However, as I look back on the work they did, they were true artists. There were many times I went with dad as he worked his magic with a landscape. 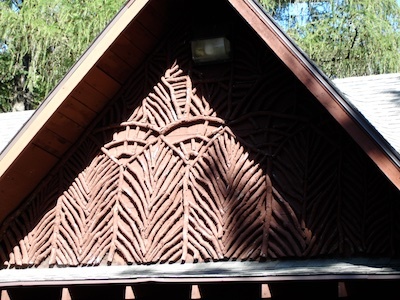 His father taught him how to create beautiful lattice work accents (bridges, decorative elements for buildings, etc.). I watched, observing the care my father had for the trees and plants he tended. I believe that is where my deep appreciation and respect for nature started. This is the ‘why‘ behind Treescapes; my dad, his father, it’s in my blood. This is one of the last remaining works of my grandfather in the park of my home town. As I create the pieces in the Treescape series, things just flow for me. The ideas, designs come easily and it feels almost effortless. Each piece is unique like my fingerprint. I am so grateful that this work still calls to people. I will continue to make these pieces because they are my heart, my voice, my essence, my soul. My dad’s birthday was this past Friday, January 23. While he left this world in 2005, never seeing his influence on my art, I have this sense that my dad is happy with these works and smiles knowing his influence is there. I have my ‘why‘. I am happy to announce that three pieces from my Treescape Series have been accepted into the Arvada Center’s 2013 exhibit entitled Art of the State, a juried exhibition of Colorado artists. Last month, Sean Brown shared with our group, Colorado Creative Connections on Facebook, the call for entries for this exhibit. Reading the prospectus, I thought this would be a great venue for my work to be seen, so I applied. It is such an honor for me to have my work selected from all of the entries. There were 588 artist applications with 1,635 works submitted. The jurors selected 195 artworks by 162 artists. I know there are times in our lives, as artists, that this kind of affirmation is truly humbling and this certainly is for me. Reaching for the Sky, pictured at the top of this post, is the one of the three pendants that will be shown in this upcoming exhibit. 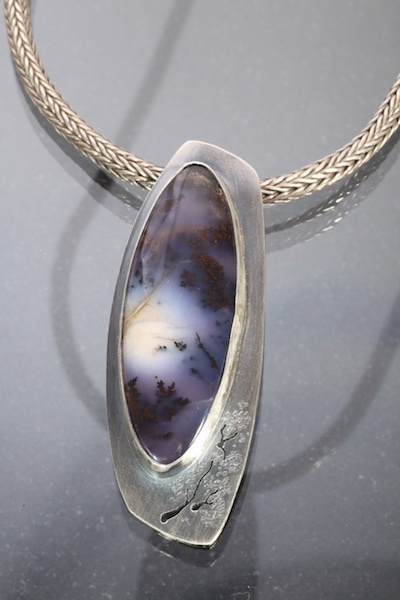 The stone is one of my favorites, Dendritic Opal. Those little dendrites formed another beautiful tree, that I see reaching for the sky. In the upper left hand corner of this stone I see a subdued sun. 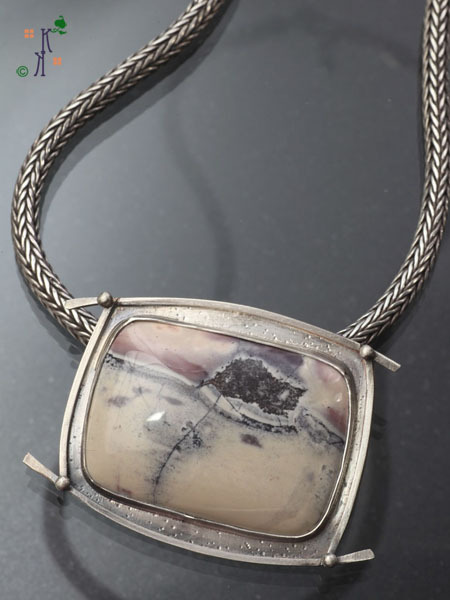 The setting is sterling silver with a light oxidation. Next in the group is a beautifully pale Porcelain Jasper. I see a bluff in the background, pale pink & lavender sky with a few clouds. The white plains leading up to the bluff have some scattered rocks and there is the trail leading one to the bluff. In my mind, I envision a great journey to get there. A small evolution in Treescapes here, no trees! I did texture the back plate of this setting and added the wire frame that gives it some of the characteristics found in Treescapes. You may remember Still Standing from an earlier post this past July….my tribute to the fire fighters who battled the Waldo Canyon Fire. Amethyst sage set in sterling silver with a faceted amethyst tube set. It certainly seems that 2013 will be a remarkable year. 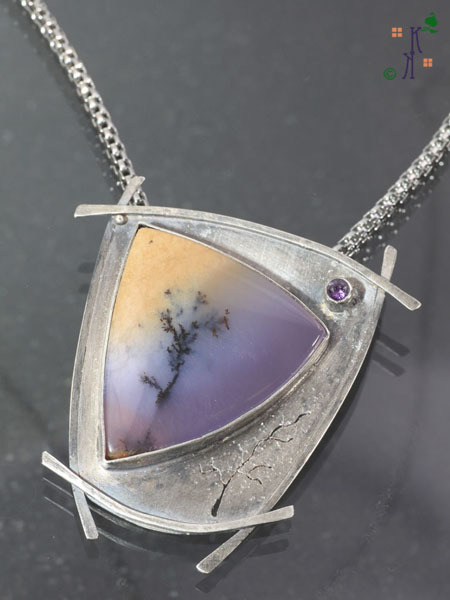 All three of these Treescape pendants will be on display and available for sale at the Arvada Exhibit that will run from January to March 2013. I will provide more details as the dates draw near. 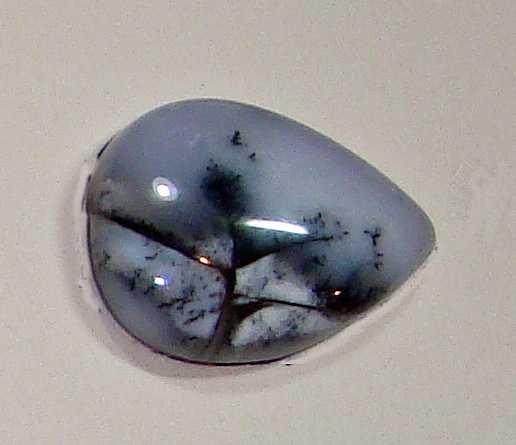 Dendritic Opal. I have been drawn to these stones ever since my first gem show. I brought home a few at that time and since then, they continue to call to me. As you have seen, I have used them more and more in my latest works. Of course, they have been the inspiration for my Treescape series. The beauty and stark contrast of black and white has always appealed to me. The delicate scene in this stone reminds me of an early winter morning. The landscape has a fresh covering of snow. A few birds are flying over this tranquil valley. Some trees and bushes emerge as guardians for this serene setting. Such a peaceful, calm winter morning. I can imagine myself hiking through the snow, taking in the sights and sounds. Everything is hushed, just the crunching of the snow underneath my boots and the melodies of a few song birds who have ventured out. Refreshing ones’ spirit, mind and soul. Winter’s Stillness is one of my latest Treescape works. 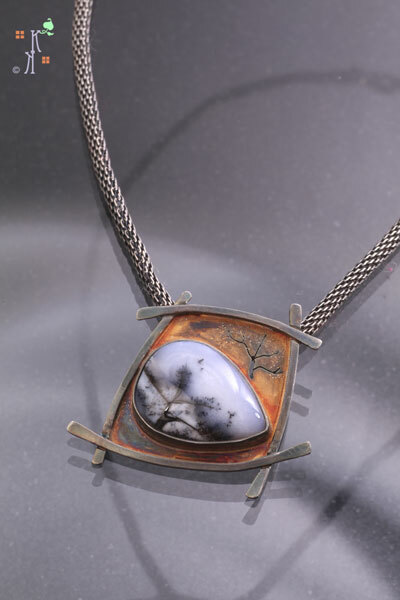 The colorful oxidation for the sterling silver setting is the result of a few attempts. You know, it’s ok if you don’t like your first result, keep working with it until you get it right. For this setting, I wanted something rich and colorful to provide a backdrop that would allow this stone to ‘pop’ when you see it. There are some fiery rust elements with striking steal blue and purple accents. I’ve preserved the finish with a light lacquer coating. May you find the peace and serenity of this quiet winter morning in your life. Interesting title? I like the contradiction of the words. Once again, I see this little isolated tree in a sea of white. Lonely? Perhaps. Yet I have this sense that the little tree can be a companion for the wearer of the piece. Hence, Solitary Companion; another from my Treescapes series. 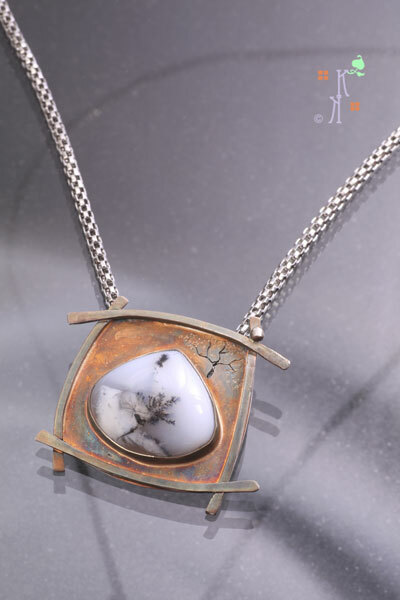 This beautiful Dendritic Opal came from my shopping finds with Mark Lasater of The Clamshell. Set in sterling silver, with more of the colorful oxidation that has a light coat of Renaissance Wax to help preserve the color. The piercing in the upper right corner of the piece is my replication of the solitary tree I see in this stone. I added some texture to represent the ‘leaves’ that those little dendrites form around the tree in the stone too. I’m having great fun with these new pieces. 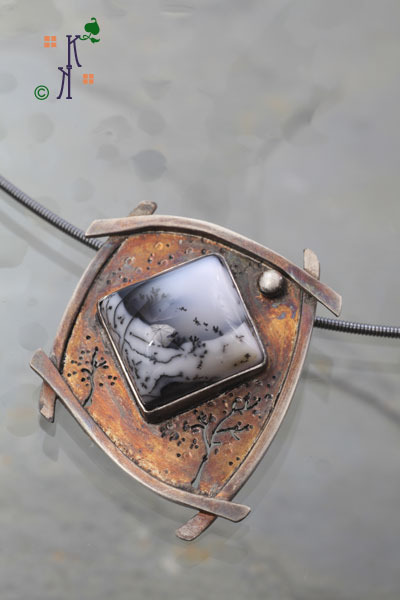 While Treescapes was originally inspired by the Dendritic Opals, other stones will be finding their way into this collection. 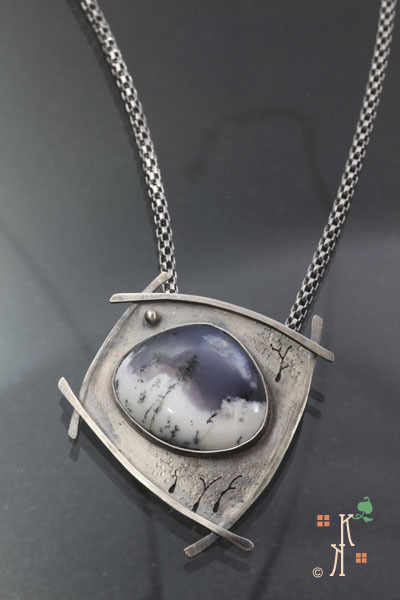 More to follow…..
Another from my Treescapes series, inspired by the imagery in the Dendritic Opal stone. There are a number of interesting butte formations close to us. I actually found one called Chalk Butte that looks a great deal like the formation in this stone. Yet with all the white, this one just reminded me of how things look after a fresh snow fall, so I call this Snowy Butte. This stone is another I bought from Mark Lasater of The Clamshell. 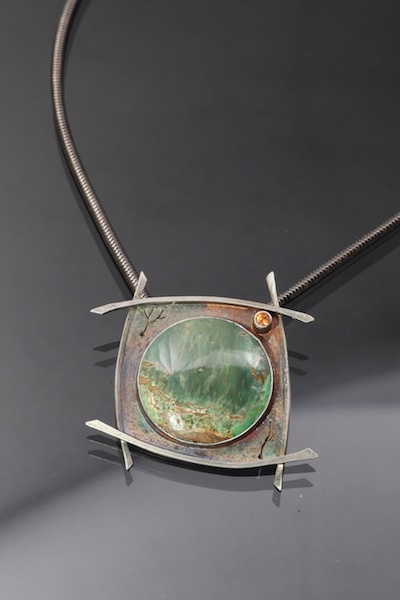 The oxidation provided an even more colorful backdrop for the sterling silver setting. I love the bluish tint in the upper left hand corner; a bit of an extension of the ‘sky’. I carried the shrubs into the top of the setting with some piercings for the branches and texture. Continuing to experiment with the look and feel of these, I added a small silver ball to the frame too. In September 2011, I attended The Gem & Mineral Show in Denver, CO. Lexi & I spend a day together at the show and visit our favorite lapidary artists. 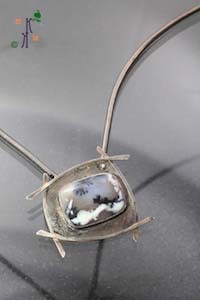 I purchased this Dendritic Opal from Mark Lasater of The Clamshell. The minute I saw this stone, I could envision what I would make. It became The Inspiration for my Treescapes series. Mark and his wife, Christa, always greet us with warm smiles and enthusiasm. They know Lexi’s favorite stones and mine. This year Mark said, let me show you these little Dendritic Opals. Smaller sizes and each one had these very interesting tree shapes in them. They were gorgeous. I bought a number of them. My first selection was the stone in this setting, because, it had the most prominent and striking tree. The first in my Treescapes series was Evening Moon, which is an Amethyst Sage that Mark gave me at the end of that shopping spree. Now the series has ‘come to life‘ and I have completed several more with the Dendritic Opals that were the impetus for the series. I will write a brief post on each of them in the coming weeks. 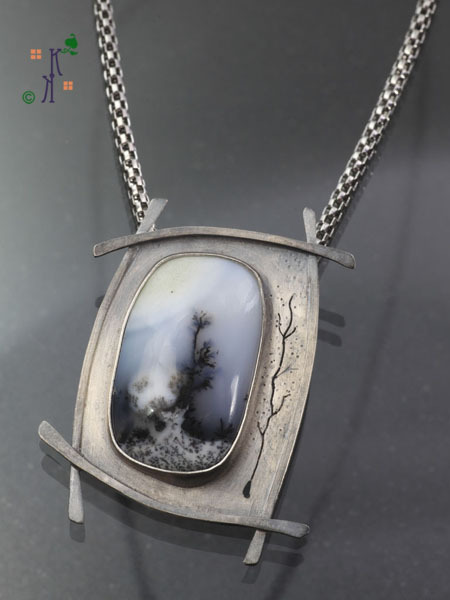 Each piece has an Oriental theme; most are framed with square wire and have piercings of the tree shapes replicated as part of the background in the setting. Each has been set in Sterling silver and oxidized. Some of my recent Treescapes have a bit more color from the oxidation process. I’ve used a light coating of Renaissance Wax to help preserve the brighter colors created by this oxidation. I am curious to know your experiences when you have seen something and it immediately generates an idea for your art work? Please share your thoughts in the comments. Do you find yourself discovering new paths every day? I find that I am and it gives me a great sense of renewal. Every day is a gift. What we do during that 24 hour span is our choice. Free will. Some days are squandered. Some days are tremendously productive. I think that Steve Jobs passing last week has given me even more introspective reflection and a hunger, thirst to make every day count. Sometimes, that may not be completely possible, yet I believe it is vitally important. None of us know how much time we have here. Our words and actions may have an impact or influence on those we meet each day. We may never know or one day someone may share that something we did had a positive impact on them. Do you think Steve Jobs fully realized his impact on our lives? Maybe he did to some degree, but I cannot help but think that he may not have realized the full extent his innovations and insights had on our daily existence. Personally, I believe his influence will be felt for many, many years. I know I am on a Discovery path. Coming off of the Jewelry at the Gardens event last weekend, seeing all the creative spirits there, I am inspired to continue to grow even more as an artist. That growth will bring about new revelations for me and where I will take my work. The photo at the top of this post shows a few of the Dendritic Opal stones I purchased from Mark & Christa Lasater of The Clam Shell last month at the Denver Gem & Mineral Show. When I first saw these, a idea for a new series started to flicker in my mind’s eye and then the floodgate of designs opened. Not a single design has been sketched, but I can clearly see what I will be doing. Do you hunger for this sense of Discovery in your life? I hope you will share your thoughts on this topic. For me this sense of Discovery is part of what makes humans so complex, unique, and interesting. If you haven’t found that hunger in your lives, I encourage you to do so. Until next time, aspire to be more as an artist an a person. This is one of my selections from The Clamshell. It is called Amethyst Sage. Of course it has my favorite color, a pale shade of purple. The image created in the center by part of this stone reminds me of a tree. I love the shadings in the stone too, from the light shade of purple (lilac) to the rich sandy tones. I found a number of wonderful stones at The Clamshell. There are a couple I have to research to find out what they are. Most of the vendors provided information about each stone. However there were a couple available at The Clamshell that weren’t labeled. I thought they were beautiful and knew that I would eventually find out what they are. These are called Picasso Stones. I am quite taken by the markings in these. They remind me of tree outlines. Plus I really like the unusual shapes of these. I think they will be great focal points in pendants. This is one of my unidentified treasures. I think it might be a Lace Agate, but I’m not certain. I will run this one past Lexi to see if she can help me identify it. I was drawn to the patterns along with the purple and rust colors. Part of this stone seems subdued, but I think with the right design it will be quite stunning. These are my mystery stones. Mystery Solved! 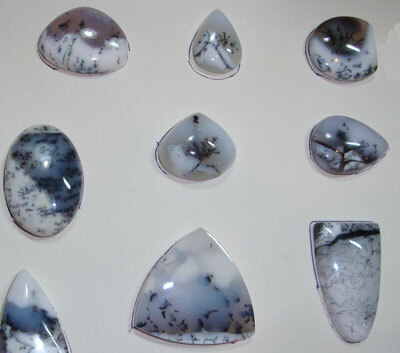 Thanks to the wonderful slides of their work on The Clamshell’s website, I found that these are…..drum roll….. Dendritic Opal, White Base with Black Dendrites. VERY COOL I was intrigued by the unusual patterns and the stark black & white combinations. I think they will make interesting and beautiful pendants. One of the great things I like about having a nice foundation and variety of stones is that I have an opportunity to come up with all kinds of design possibilities. I am finding that the designs I have on paper tend to evolve as I work on putting them together. I enjoy that immensely. Hope you enjoyed these beauties. I still have more to share and remember, the best is yet to come. Aspire to be more as an artist and a person!